In an interview with Der Spiegel, former German foreign minister Sigmar Gabriel, outlined his point of view on the ongoing Nord Stream project, as well as lambasted those who distort the letter of the law for the sole purpose of penalizing Russia. The European Commission doesn’t forbid the construction of the gas pipeline Nord Stream 2, as this project doesn’t contradict European Law, former German Foreign Minister Sigmar Gabriel told the German magazine Der Spiegel in an interview. “I don’t support those who pervert the law for the sake of punishing Russia. And as long as Moscow adheres to European regulation, it is up to German economy to decide who it should buy gas from,” the politician asserted. Separately, the former German foreign minister vehemently opposed the Der Spiegel journalist’s statement that “it is not politically smart” to always rely upon the criteria of lawfulness. “You should think again about what you’ve said. If we rely on “wits” and not the law, we will be just a step close to abuse of power. The terms of agreements must be met. We accuse Vladimir Putin of changing laws, when this is politically justified. We have no right to do so,” Sigmar Gabriel stressed. During the course of the interview, the former German diplomat also explained why he, while he was a foreign minister, without Chancellor Angela Merkel’s approval, suggested easing sanctions against Russia in exchange for placing a UN peace-support mission in Eastern Ukraine. “I noted unambiguously then that this is my personal point of view and it is different from the government’s official stance. But I bet this is exactly what’s going to happen. If Russia agrees to take heavy weaponry from there and put there “blue helmets”, it will logically lead to the sanctions being reversed,” Gabriel noted. The journalist in his turn reminded the politician of the conditions needed for the Western sanctions to be withdrawn, namely the restoration of Ukrainian territorial integrity. “We must continue to pursue this, but anyone who wants jam on it is sure to lose," the ex-minister retorted. 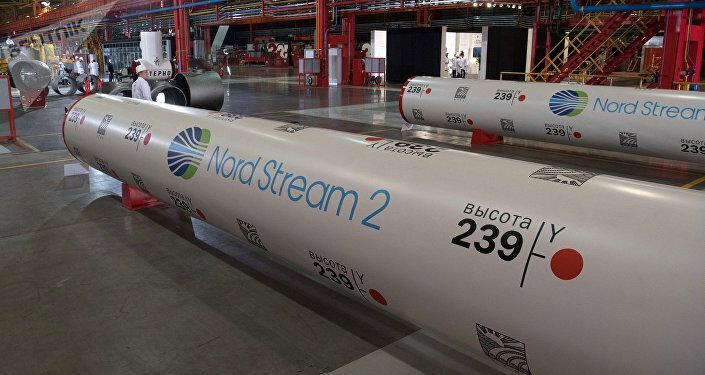 Nord Stream 2 AG is owned by Public Joint Stock Company Gazprom, while its investors include France's Engie, Austria's OMV AG, UK-Dutch Royal Dutch Shell, and Germany's Uniper and Wintershall. The pipeline is designed to bring gas from Russia to Germany via the Baltic Sea. While the project is lauded by a number of European countries as promising, it is strictly opposed by others, including Ukraine, which believes it will suffer transit revenue drops when Nord Stream 2 starts operating. US President Donald Trump also bashed the initiative, when responding to journalists’ questions before meeting his Polish counterpart Andrzej Duda. He sais the US deems it “inappropriate” and “very bad for the German people” that European country is paying Russia “billions and billions of dollars.” Washington is meanwhile taking measures to block the Nord Stream 2 project. Most specifically, the CAATSA law (Countering America's Adversaries Through Sanctions Act), adopted last year, stipulates a possibility of slapping unilateral limitations on companies, which, among others, are directly involved in the gas pipeline project.